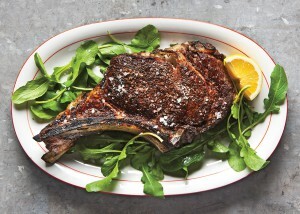 Bon Appetit calls this Salt-and-Pepper Rib Eye “Perfection” we couldn’t agree more! Start by picking up a beautiful rib eye from your favorite meat distributor (ah-hem! ), then follow below. This simple prep has mouth-watering results! Put steak on a wire rack set on a rimmed baking sheet. Pat dry with paper towels. Season with 1/2 tsp. salt per side. Chill uncovered for up to 3 hours. Remove steak from refrigerator 1 hour before grilling and let come to room temperature. Pat dry with paper towels. Season again with 1/2 tsp. salt; press in 1/2 tsp. pepper per side so pieces adhere.